Thailand, being located far from the wheat producing regions of the north, is an excellent place to look for naturally gluten free foods. Happily for the gluten free home chef, a number of packaged curry pastes are available and need only to be mixed with coconut milk, meat and vegetables to make a quick, easy, and best of all, mouth-watering gluten free meal. This versatile Thai food can be adapted to any combination of vegetables you might have in your pantry. Try the following coconut milk curries to begin your adventure in Thai cooking. Green curry paste is one of the spiciest curry pastes. 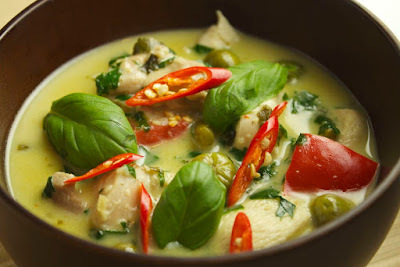 It is based on green chili peppers and a number of fresh herbs. The overall spiciness of this dish can be adjusted by the amount and type of vegetables added. Starch vegetables such as potato and squash will provide a cooling influence. 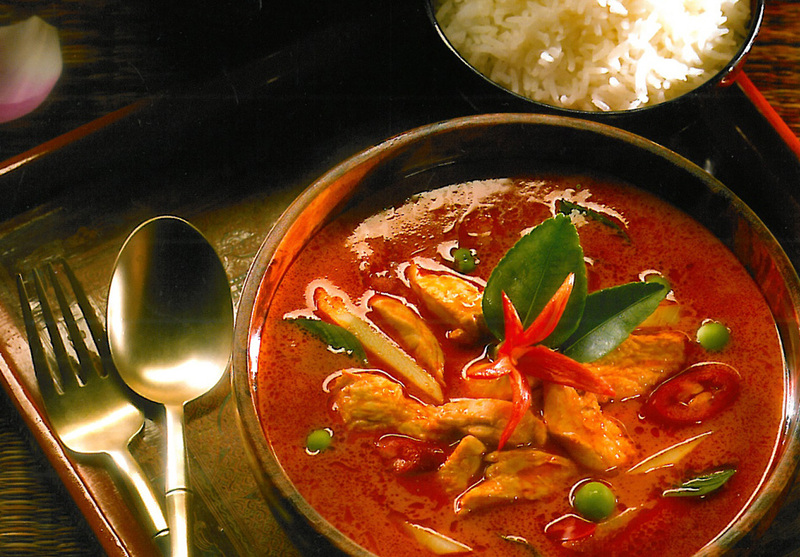 Red curry is a very basic curry, usually based on peppers, lemon grass, garlic and turmeric, and is medium spicy. It is very versatile and can be prepared with a variety of vegetables and meat. 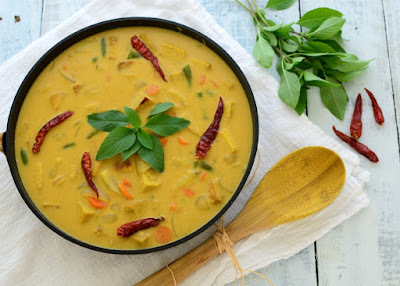 Yellow curry is a milder curry, and differs from many the preceding curry pastes as it contains dried spices as well as fresh ingredients. This curry paste is frequently prepared with chicken and potatoes, but also lends itself well to many vegetable and meat combinations. Massaman curry comes from the south of Thailand and contains a different blend of spices than the above curries. 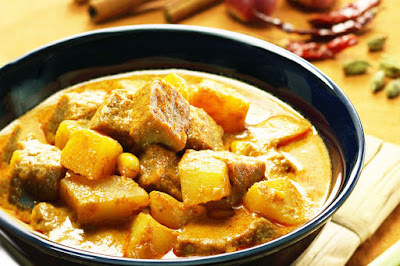 It is a mild, slightly sweet curry perfect for people who do not enjoy spicy food. Peanuts are a key ingredient in this curry. Most Thai curries can be prepared in the same basic manner. Scoop the coconut cream (the solid layer found at the top of a can of coconut milk) into a saucepan and set over medium heat. Add the contents of the paste packet. Cook, stirring constantly, for 1 minute. Add the meat of your choice, cut into bite sized pieces. Stirring frequently, cook until the meat begins to change color. Add slow cooking vegetables, such as carrots and potatoes and mix thoroughly. Pour in the remaining contents of the can of coconut milk, as well as an additional can of water. Simmer until vegetables have softened and the meat is thoroughly cooked. Add quick cooking vegetables, such as greens. Taste and adjust seasoning with about 1 teaspoon of sugar (preferably palm sugar), lemon juice, fish sauce and gluten free soy sauce, to taste or according to the directions on the spice packet. Many Thai curry pastes manufactured in Thailand contain shrimp paste, but vegetarian curry paste can be found at many health food stores. 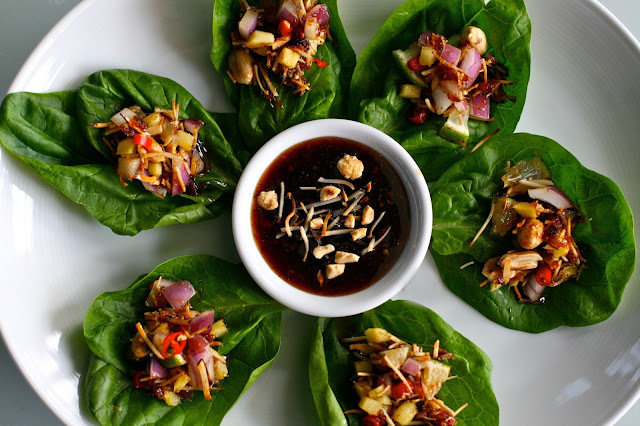 In place of fish sauce, try adding soy sauce to contribute saltiness and complexity of flavor. In place of meat, try tempeh, fried slices of tofu or cubes of tofu that have been dropped in boiling water. 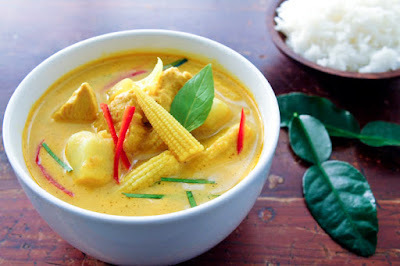 Serve Thai curry with steamed rice. Jasmine rice adds a lovely aroma to this meal.